On the first day of Christmas my true love gave to me… a beer and cider Holiday Party! 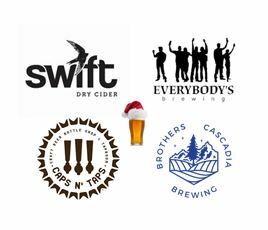 *Win some cool stuff from Everybody’s Brewing, Brother’s Cascadia Brewing, and Swift Cider. *Enjoy some complimentary homemade holiday treats!